The Celebration edition of Thrawn will cost $35 and will only be available at the convention. There will be no pre-orders, so attendees must go to the Del Rey booth at Celebration. 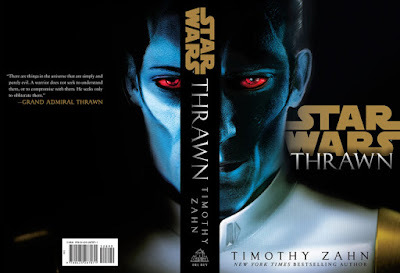 If you can't make it to Celebration, but still want a different edition of Thrawn, Barnes and Noble will also have an exclusive edition with a black cover and a pull out double-sided poster. This edition will cost $28.99, the same as the regular (white cover) edition. Star Wars: Thrawn tells the canon backstory of the villain Grand Admiral Thrawn. The character was first created by author Timothy Zah back in the 1990s for the novel Star Wars: Heir to the Empire. Though novels published prior to September 2014 have since been rendered non-canon ("Legends"), the character's popularity led to him being introduced into the new canon the third season of the animated series Star Wars Rebels (where he voiced by House of Cards star Lars Mikkelsen). 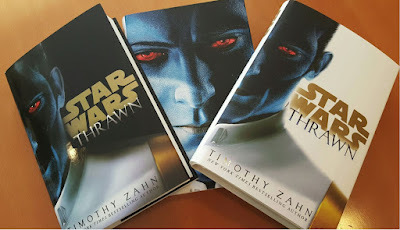 You can read an excerpt from Thrawn here. Star Wars: Thrawn hits shelves on April 11th. Star Wars Celebration takes place in Orlando, Florida from April 13th-16th. I already prepaid mine today. So I am gonna get at my door the b&n exclusive edition hardcover probably a day or days after the book release next month. So I could wait and read EMPIRE'S END. I got plenty of time. And I am reading by taking my time. Only over 400 pages.